Finally, a way to revisit Microsoft BASIC 2.0. Not content to sit on the sidelines, the Internet Archive recently resurrected something, too. This time, it's a swath of apps, games and software from the original Macintosh circa 1984. That means stuff like Lode Runner, MacOS System 7.0.1, Microsoft BASIC 2.0 and Space Invaders are on offer in their pixelated, black-and-white glory. Just like the old days. Except, you know, these run in a browser window. The Archive says this collection of stuff from 1984 to 1989 is just the first set of emulations from the machine, so it might not be too long before more apps are available. For an idea of how faithful these facsimiles are, you can even erase the disk of Wizardy 1, or any other app, if you want to relive one of the biggest "oh crap" moments of your youth. Archive didn't emulate your dad's rage-filled response, though, so it's probably not nearly as fun -- or frightening -- as doing it as a kid might've been. The files can be a little buggy. 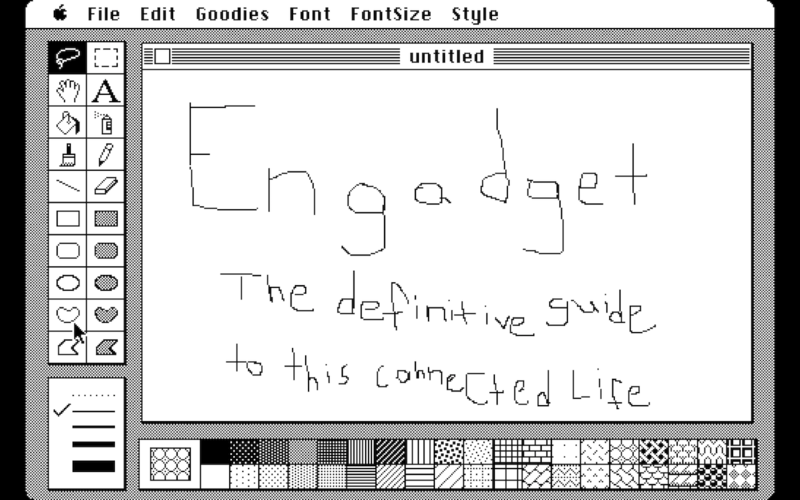 Going fullscreen in MacPaint 1.5 crashed the emulator my first time, for example, but that should be expected when you consider that this software is pushing 30 years old (if not older) and running in a web browser. After that, it ran well enough that I was able to scrawl out the image above. If you've already turned your original model into an aquarium, it's probably easier to run the software this way than telling Mr. Bubbles he needs to find a new home because it's high time that you finally beat Pyramid of Peril would be.